The king Henry IV dreamed up this square full of harmony and imposed the elegant symmetry of the arcades for the convenience of passers-by and shoppers. 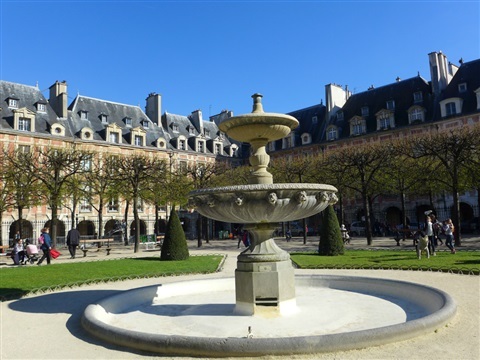 It is still the most elegant square in Paris, surrounded by thirty-six pavilions with red brick and white stone facades, slate roofs, all constructed over broad arcades. The Restoration and the second French Empire returned temporarily the old royal name until 1870. In his book “the Parisian pedestrian” published in 1939, Leon-Paul Fargue described several districts of Paris, among which Place des Vosges. 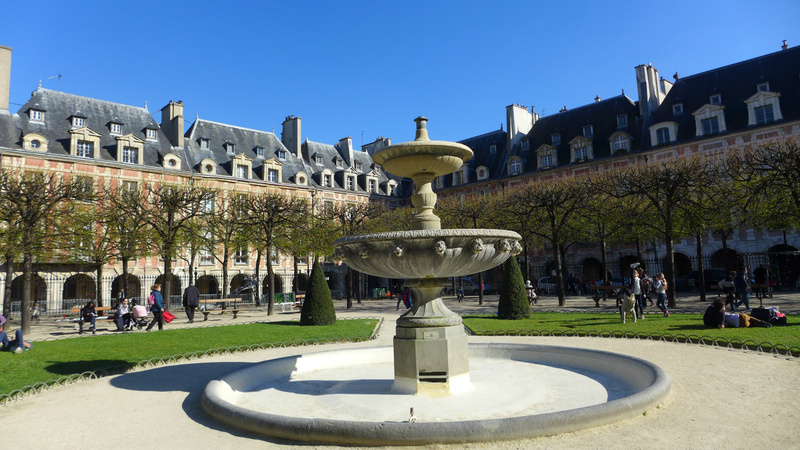 At his time, the Place des Vosges was essentially inhabited by common people, far from which it is today, mostly inhabited by rich politicians and celebrities and crowded during sunny days. Although mostly occupied by common people, it was a quiet square and its harmonious pink mansions had kept all the elegant nobility of its origin. Even before its creation by King Henry IV, the location had a royal dimension; it is standing where there were the gardens of the Hôtel des Tournelles, which was a royal residence. King Henri II died there after been severely wounded by Montgomery during a tournament. His wife, Catherine de Medici decided to demolish the baneful building. The widow of King Henri IV inaugurated it as the “Place Royale”in 1612. Immediately, it became the place where to be, where to live in order to be part of the elegant Parisian caste. Since its inauguration, the square was inhabited by wealthy aristocrats until the French Revolution. After the French Revolution, like in the whole district of le Marais, the mansions were divided into small rented apartments and were occupied by craftsmen. 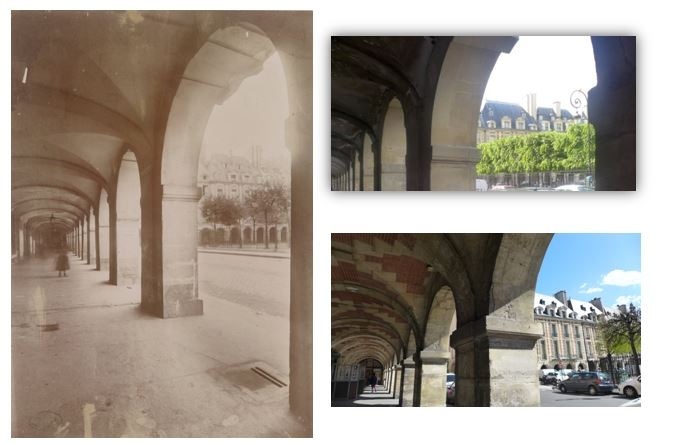 Starting 1970, they were renovated after André Malraux, Minister of Culture passed an important law to protect areas of great historical importance like le Marais and Place des Vosges. At first, there was nothing but sand in Place des Vosges traditionally used as a ground for tournaments and parades. In order to get an upper view above the festivities, King Henry IV had his pavilion built taller than the other buildings on rue de Birague. The Queen Pavilion is on the other side, on rue de Bearn. 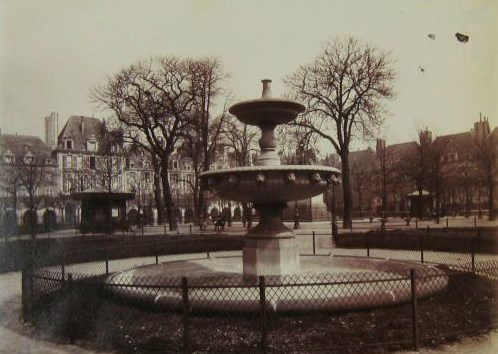 The fountains in the four corners of the garden were built by King Louis Philippe during the Bourbon restoration in the 18th century, along with the iron gates. A copy of the statue of Louis XIII melted down during the French revolution was also placed back in the middle of the garden. Take the time to relax in the garden, near one of these four fountains; let yourself be taken in a daydream and enjoy the view over this delicate stone landscape through the linden trees which have replaced in the 70s the diseased elms.